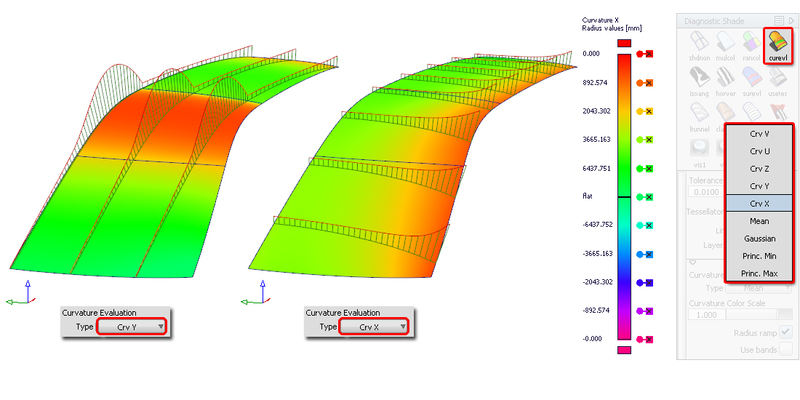 Surface curvature can be displayed as a continuous color plot across the area of the surface using the Curvature Evaluation shader in the Diagnostic Shading panel. In these examples, the evaluation direction is specified in one direction, and so there is a straightforward correlation between the color plot and the linear comb plots. However Surface Curvature is generally more complex to use and interpret than Curve Curvature, because each point on a surface can have different curvature values, depending on which direction you choose to evaluate. The curvature shader samples many points across the surface. At each point, the curvature could be evaluated in any direction, and a different value found for each one. Because of this complexity, there are additional curvature types that can be used for particular tasks: Principal Minimum, Principal Maximum, Mean and Gaussian. At each point on the surface, the software finds which directions on a surface have the smallest/largest radius. The Principal Maximum finds the tightest curvature and is useful in showing changes in surface direction and identifying a patch layout. It can also be used to find areas outside legal limits for minimum radii. The Principal Minimum finds the flattest curvature and can be used to find areas that are too 'flat' which might cause strength problems in large metal pressings. Mean curvature gives the most intuitive indication of the character of the surfaces, but is less useful for analysing specific conditions. Gaussian is good for identifying inflections and for locating saddle surfaces, but is not useful for a more general appreciation of the surface character. Before the Surface Curvature can be correctly calculated, it is essential that the surface normals are all pointing in the same direction. 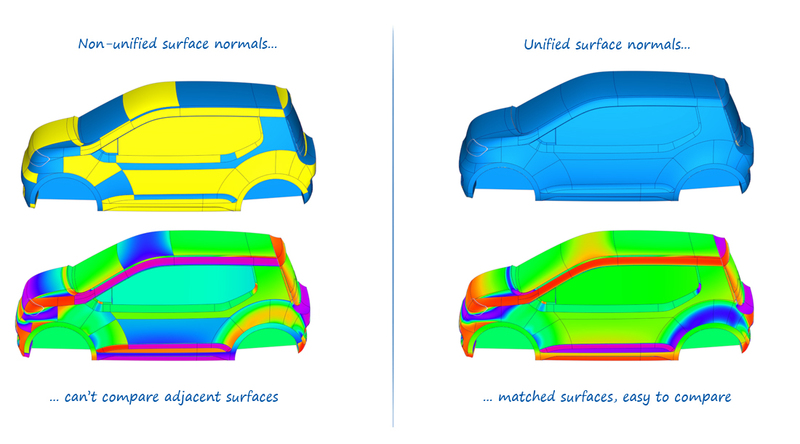 Use Surface Edit → Orientation → Set Orientation and drag select or pick individual surfaces until all are shown in blue. Applying and interpreting the surface curvature color map requires considerable experience and skill, and can be confusing for the new user. The zebra stripe shader and the linear comb plots are adequate evaluation tools for concept development, and the curvature shader only needs to be mastered if you are working on Class A or Reverse Engineering work.